In the Weingartshof depot project for the city of Linz in Aus- tria, the ground slab below the signalling installations has been reinforced with glass fibre-reinforced polymer (GFRP) bars. Each GFRP bar consists of a multitude of endless, paral- lel glass fibres embedded in a resin matrix. 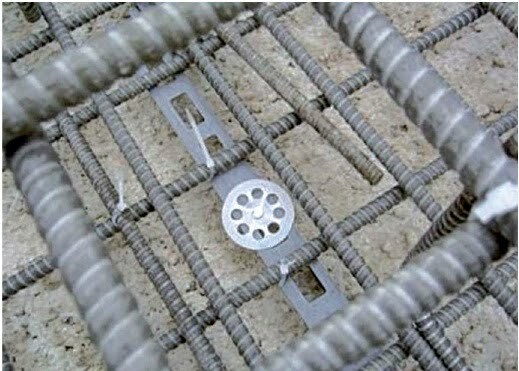 Besides the ad- vantage that these bars are not electrically conductive, GFRP reinforcement is characterized by its high corrosion resistance and high tensile strength. Autumn 2011 is the planned completion date of a further tram line for the city of Linz. And for the first time a tram line will carry passengers beyond the boundaries of the city. The EUR 150 million project is the largest local public transport invest- ment in the city. Additional trams with their own depot will be needed for operating this extension to the existing tram net- work. The new Weingartshof depot will provide space for a total of 14 trams and will include sidings as well as a maintenance area with workshops on a total footprint of approx. 7800 m2. One special feature involves the reinforcement in the region of the signalling installations. In order to overcome the problem of electromagnetic induction with electrically conductive reinforc- ing steel, the traditional steel bars have been replaced by GFRP bars in this area. Each GFRP reinforcing bar consists of a multitude of endless, parallel glass fibres which are embedded in a thermoset resin matrix. The bars are manufactured using the pultrusion process. Besides being electrically non-conductive, GFRP bars are also highly resistant to corrosion. Consequently, it is no longer neces- sary to raise the alkalinity of the concrete artificially in order to provide protection against corrosion, which in turn reduces the alkali-aggregate reaction (AAR) in the concrete. FiReP® GFRP reinforcing bars are also characterized by their high tensile strength of > 1000 MPa and their continuously pro- filed surface, which develops a good bond behaviour similar to that of steel reinforcing bars. The bent shear links also have continuous profiling. Fig. 1. GFRP reinforcement for future signalling installations. Fig. 2. 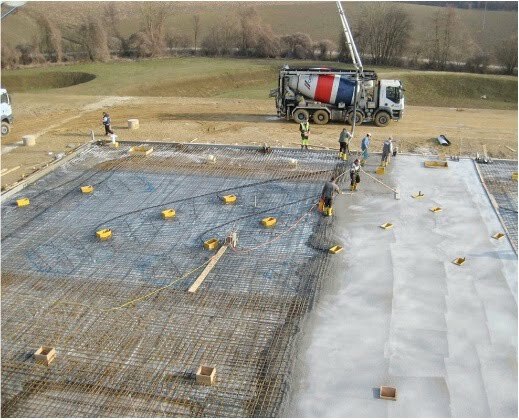 Concreting the ground slab. Fig. 3. Securing the GFRP reinforcement against flotation. Compared with steel, GFRP has a very low relative density and therefore tends to float on the wet concrete. Therefore, the GFRP bars must be secured against flotation with special nails driven into the blinding. During planning, it is important to remember that subsequent bending of the cured, thermoset GFRP material on site is impos- sible. All links, chair bars, starter bars, etc. are produced in the factory in millimetre precision according to the reinforcement layout drawings. The Swiss company FiReP® International AG, based in Rapper- swil, St. Gallen, was appointed to provide the GFRP reinforce- ment. The design and layout of the double layer of reinforce- ment was worked out in close cooperation with the contractor, the Linz branch of Bilfinger Berger Bau GmbH. The whole area had to be built entirely free from steel and so all straight and bent bars (e.g. chair bars) were made from the GFRP material. 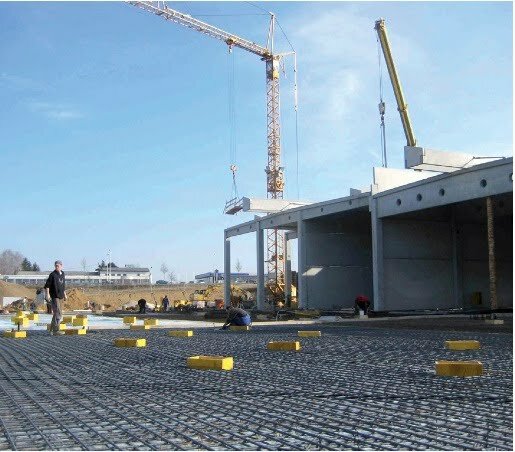 Some 900 m2 of ground slab was reinforced with GFRP bars and concreted in the spring of 2010 – and released on time for the following trades.